Liebert HPC-S Free Cooling Chiller, 192-362kW, provides chiller support for small to mid-sized computer rooms, with cooling capacities of 192kW (55 tons), 285kW (81 tons) and 362kW (103 tons). Free cooling data center chillers are designed to efficiently supply chilled water to indoor data center thermal management equipment. 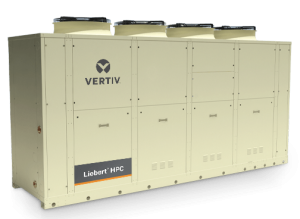 The integrated free cooling technology used by the Liebert HPC-S Free Cooling Chiller allows it to cool water when the external ambient temperatures are below the chilled water return temperature. This reduces annual energy consumption of the entire chilled water system by over 30% in most applications, while improving system availability at the same time. The HPC-S Free Cooling Chiller enables data centers to achieve increased efficiency while reducing environmental impact, through its ability to work in free cooling mode. This operation leverages the external environmental conditions to cool the water, thus requiring compressor operation only when the outside temperature exceeds the temperature of the water returning to the chiller. This occurs during more than 50% of the annual operating hours for most of the US.